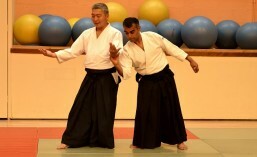 There are many techniques in Aikido that go under the name of Kokyunage. The Kokyu part can be translated as Breathing or Timing. So we have Breath-throw or Timing-throw. When we sit by ourselves and practise Kokyuho we are developing in our bodies the understanding essential for the correct practise of Kokyunage and the timing at the heart of all Aikido techniques. Good breathing is also essential for health, for life itself. We can go without food for many days. We can go without water for a shorter time, but days again. Without breathing we can die in minutes. Good mindful breathing is also at the heart of meditation.